For a very long time I (Devin) have been annoyed with how reports were created in WRMD. Starting from the layout of the Reports page, through the inability to customize reports for my own needs. Well, as of today all that is changing. This new reporting system has some very simple goals. To simplify the processing of finding the report you want to produce. To create more flexibility around the formats of the reports. To allow you to customize what the report is reporting on. Finding a report should not be a chore. Your most commonly used reports should be on top of the list, so we created a feature for that purpose. Reports will now be listed in groups instead of being tiled all over the screen. And, to make your life easier, you can now star a report as a Favorite! By doing this, those reports will be put on top of the list. Reports can now be generated in multiple formats. The most basic format is just to see a preview of the report on your screen. When you click on a report you will be taken to a screen to preview the report and from there you can choose to print the report as a pdf or email the report. Now, many reports will have the ability to export the data directly to Excel! The best part of the new reporting system are the filters. For a long time people have asked for the ability to adjust what a report, reports on. For example, limiting the date range to a specified time frame instead of an entire year or excluding certain species taxonomies if you don’t rehabilitate all classes. A very simple example of this are the annual reports. Each annual report has a filter for a given year that it should report on. 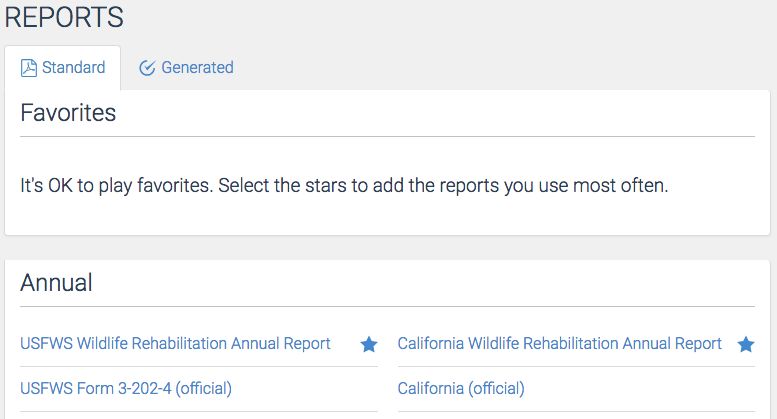 Many reports will now have multiple filters like the Disposition by Species report! Once you create one of these reports it will be saved in the Generated Reports page for 14 days. If you think you want to permanently save this report, we suggest saving the PDF that is created to your computer. Adding these filters were not just for our users, but also to help us manage the reports on the backend. Previously, we had to create multiple reports for what was essentially the same information but with slight variations. For example the Prescriptions Due report existed four times with slightly different pre-set filters. Now we can maintain one Prescriptions Due report but use the filters within the report itself to adjust what the report, reports on. Customized Reports: This capability will allow you to save a specified search and then report on the specific dataset you wish to see. This will be available in the near future. Filters you suggest: If there is a filter that you would like to see added to any of the reports, that would be a valuable addition, please let us know. We hope you appreciate this update. It has been a lot of work for the past few months and we think it’s going to be the beginning of a wonderful and powerful new feature of WRMD. If you have any feedback or suggestions then please tell us either by email or in by clicking Ask for Help in WRMD. I’ll admit it. We’ve been terrible at keeping you informed about how WRMD is doing and what updates we are making. Sorry! 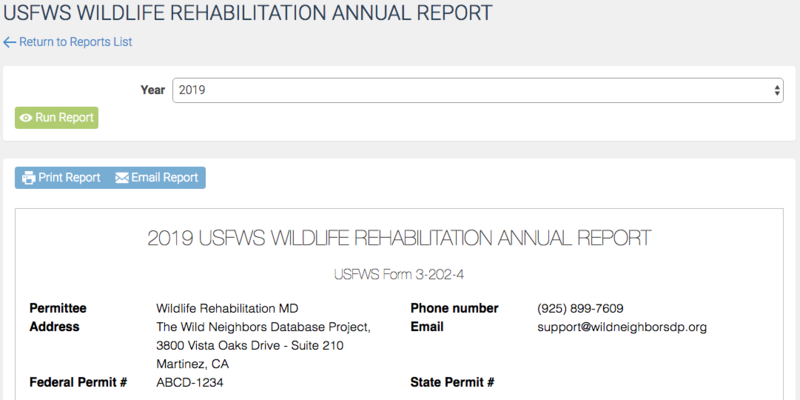 2018 was another busy year for us with lots of new wildlife rehabilitation organizations signing up, some major new features added. We also traveled to meet with our users as often as we could afford it. In 2018 WRMD admitted an incredible 231,903 patients! That is a major increase over past years. These patients were admitted in by over 500 accounts across 15 countries. Speaking of countries, we are proud to welcome organizations from South Korea, Ireland and Trinidad and Tobago! On October 26 2018 the 1,000,000th patient was admitted into WRMD! A Great Horned Owl from Raymond California admitted to Fresno Wildlife Rescue & Rehabilitation Services. We (The Wild Neighbors Database Project) have been accepted as an Oiled Wildlife Care Network (OWCN) member organization. The OWCN is a statewide collective of trained wildlife care providers, regulatory agencies, academic institutions and wildlife organizations working to rescue and rehabilitate oiled wildlife in California. 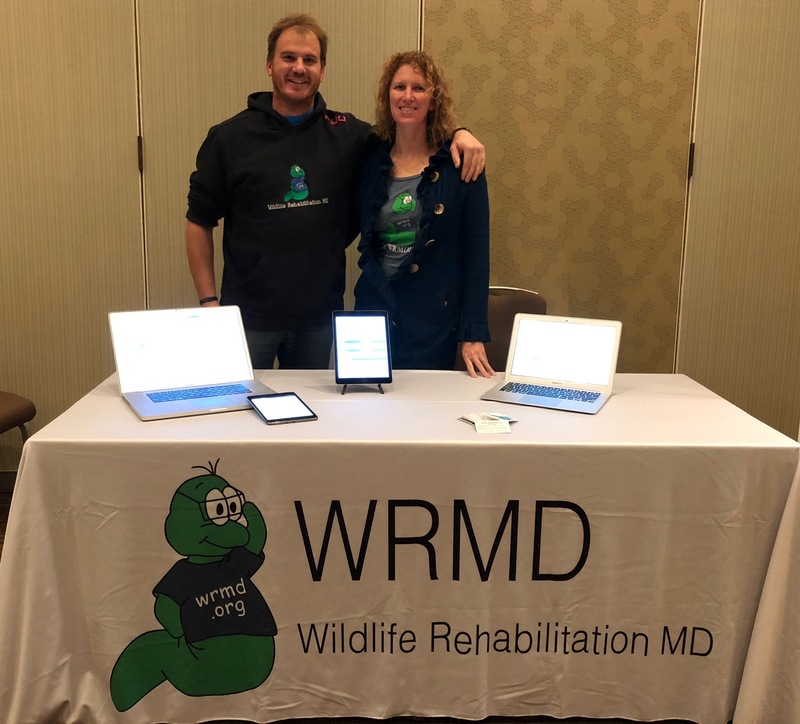 Over the past few years we have been developing a specialized version of WRMD to work specifically for oiled wildlife events. That project is nearing completion and we are now proud to be part of the OWCN response team if (hopefully never) an oil spill occurs in California. In 2019 there will surely be many tweaks and updates but we do have 3 major changes to announce. Very very soon, WRMD, will have a new way to view and generate reports. In this new way, you will be able to favorite reports for quicker access and preview reports before printing, emailing or exporting them. Each reports will also have unique filters to allow you to modify them as needed. 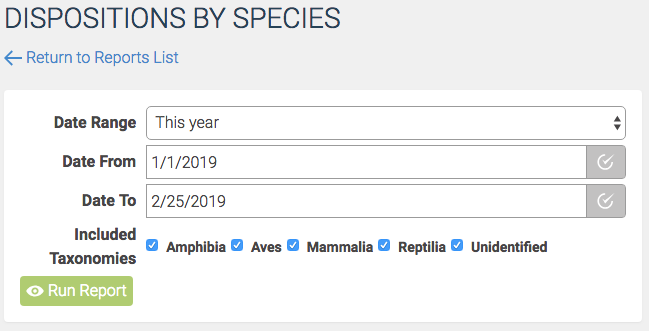 For example, in some reports you will be able to set the reporting dates or exclude certain species taxonomies. This new feature will be available in about 1 week. Expect a blog post detailing how this works. A commonly requested features is to allow users to maintain their own prescription formulary for common drug/medication prescriptions. This is number 2 on the to-do list. In the formulary you will be able to define a drug, dosage, concentration, route, frequency, duration and many other things. When your formulary is created, you can then choose a formula when writing a prescription to autopopulate the prescription fields. You will also be able to set the dose to be automatically calculated based on the patients last weight. Another common request is to have automatically triggered notifications if (for example) a certain species is admitted. We think this is a cool idea. These notifications could be sent by email and/or text message. We need to gather more information about how this might work and how you might use it so please tell us your thoughts. Lastly but not least, we would like to thank everybody that has made donations to our 501(c)(3). Your generosity is what keeps WRMD going, creating new features and answering your questions. Thank you from the bottom of our hearts. We try not to make any changes during the summer because we know how busy you are but we had to make a few to resolve some issues. There is a new field called Notes About Rescue. You can use this field to document any supplementary information about the animals rescue such as ‘had a sibling dead/escaped‘, ‘location found is not suitable for release‘ or ‘rescuer would like to be at the release‘. Adding these notes will compliment the Reason for Admission, Care by Rescuer and Transported By fields for a complete picture of the animals life before arriving in your care. We have noticed that this type of information may be written into the Notes About Rescuer field which should be reserved for information specifically about the rescuer. Such as “Nice person, has offed to have animals released at their property” or “Can be disagreeable, only staff should communicate with him“. We have added the ability to freeze a patient so that it can no longer be updated. This could be very helpful for patients with pending lawsuits or if your governing agency requires no modifications be made after the patient is dispositioned. 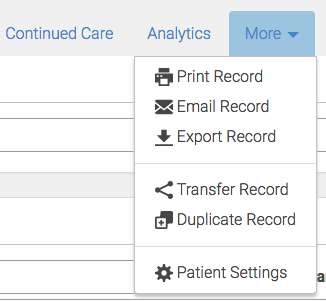 To freeze a patient go to its record and click More then Patient Settings (More was previously called Share). By default Patient Settings is only available to users with the role Super Admin or Admin. In Patient Settings, click the Freeze this Patient to Prevent Any Further Updates button. The patient will now be frozen and a “This patient has been frozen and can not be updated.” message will be display above the patients record. During the NWRA 2018 Symposium, we are pleased to announce some fantastic new features. You may have already seen some of them but there are few that are just RIGHT NOW being released. With this extension you may now record as many “daily” exams as you want. The form is just like the Intake Exam form on Initial Care. This amazing extension helps you record daily expenses for each of your patients and helps you calculate the Cost-of-Care. Each expense transaction can be categorized so you may report on (for example) how much was spent on prescriptions. You can also print out an Expense Statement for an individual patient as well as an Expense by Category report for all of your patients. If you are a wildlife rehabilitator, you probably receive all sorts of calls from the public. We are very proud to announce our new Hotline extension. You can now log your communications with the public as well as track the progress of an incident’s continued communications. Not only will be able to search the callers to see if they are repeat offenders but also be able to identify calls that may be about the same incident. We want to thank Belize Bird Rescue for sponsoring the development of the Expenses and Hotline extensions. Because of their support we were able to develop these way ahead of schedule. If you ever want to visit Belize please check out the Rock Farm Guest House at Belize Bird Rescue for a fabulous Belizean experience. When admitting a new patient, you may now specify the year that patient should be added to. Of course if you change the year dropdown list the “Next Case Number” will change to reflect the year you selected. On the recheck list you can now filter it to only view pending patients. 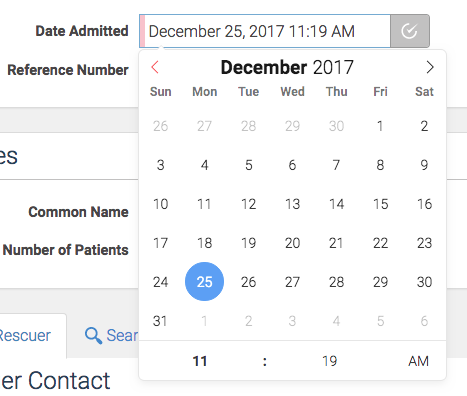 Also, if you are using prescriptions extensions, prescriptions can be filtered into each patient and will only show up if the prescription is actually due on the day request. Previously searching lab values was difficult to do and returned inconsistent results. We’ve mad that process much more simple (and it works)! On the List Patients screen you can click the List All Patients heading to select a different list to look at. We recently added Forgotten Patients and Patients Without a Location. 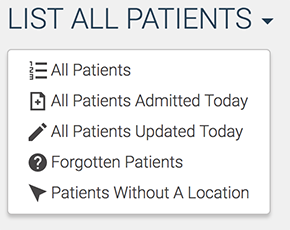 Forgotten Patients – shows all patients that have not been updated in the past 7 days or does not have a pending recheck. Patients Without a Location – Hopefully self explanatory. Shows all patients that do not have a location on their record. Begun adding new analytics and ways of filtering the analytics. Added a taxonomy tree map in analytics. In the people section there is a tab for members. Of course if you discover any bugs or have an idea that you think other WRMD users would benefit from then please reach out to us. We love to hear from you all and want to make WRMD as best as possible! WRMD will again have a booth at the NWRA symposium. 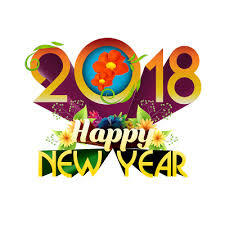 This year it is in Anaheim/Orange, CA, in our home state!!! Please come and visit us, we love to meet our users and put a name to the face. We may even ask to take a photo with your name tag so we can remember the face that belongs to the name. We will also have a presentation on Friday, March 2 at 8AM. We will talk about some of the projects we have been working on and we are going to reveal some exciting new features and extension that have just been developed! Come and find us! We look forward to seeing everybody! The WRMD team has been working as diligently as we can to make sure WRMD is fully functional. We wanted to touch on several fixes that we recently implemented and discuss some issues that have come up. The List Patient’s screen is loading much faster. We have added the “Save your Changes” Prompt back. This means you can not leave a page unless you save your data. There seemed to be several occasions where data was missing. When we researched it in the background it appeared to have never been saved to begin with. We, hope this prompt will fix the “missing data” issue. The feature that would not allow you to access a record because someone else was accessing it has been fixed. The Prescription Units will default to the most common used. Date Picker… We are continuing to see if we can create a manual way to add a date as well as pick a date. This has been very complicated and thank you for you patience. The Search Rescuer Tab under the Add New Patient screen has been fixed, there was an issue with the new Permissions. There is no longer a Shortcut Extension, however we have added a permanent “Map to Address Found” to Quick Links. Federal Report: The Nature of Injury section is filled in by the Diagnosis field, which is what we were told by the Feds to do. However Section C. “Reported Injuries/Mortalities” wants the “Cause/Nature of Injury”. This will autofill the Circumstances of Admission and the Diagnosis. Species Reconciliation: when a patient is added to the database and the Common Name is not chosen from the drop down list, the database will try to guess what you meant. If it can not figure it out it will remain an unidentified species. During this update the database attempted to reconcile many of these patients that were not identified, so you may have had a slight change in your report numbers since this update reconciled many species. If you find something funky please let us know and we will fix it. Shortcuts Extension: this extension included the Map to where the patient was found and the quick link to print record. The ability to combine Rechecks and Medications in one report. Thank you for everybody’s patience with the new update. It appears that a few users are still struggling to access their records. We have run many tests and experiments and for the most part everything is working. If you are one of those that is still having major issues, it is probably because you have an old or obsolete Browser. If you are using Internet Explorer you need to update to either Google Chrome or Firefox. Microsoft no longer supports Internet Explorer and has not updated it to allow for new software and never will. If you are using rather old versions of any other browsers, now is the time to update it. Some of our new features can only run on the updated browser systems. First off, it is important to understand that very little in the foreground of WRMD has actually changed. Most of the updates are in the background and nothing has been removed. 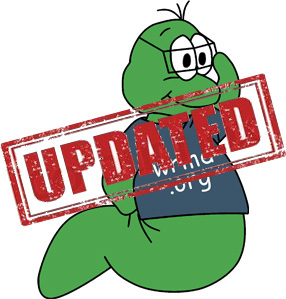 Every few years WRMD requires an update. Technology changes so quickly and new features become available to us. However, at some point we can’t add new features until we implement an update. Once updated we are able to create new features. For this update the entire background code has been cleaned up. This will mean that overall, WRMD will be more efficient and easier for us to maintain. 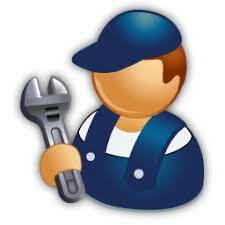 This allows us to make changes and create new features more easily. We have put a lot of effort into improving the user experience. WRMD will be quicker due to the fact that we have added more servers, that are themselves, far more up to date. Many minor quarks and bugs have also been dealt with. Before we list the new updates we want to thank all of the generous individuals and organizations that have made recent donations to WRMD. We are committed to keeping WRMD free to use however, it isn’t free to us. Each of these updates takes a lot of time and resources on our part, so we greatly appreciate any financial contributions you are capable of making. Thank you all for sticking with us on this amazing journey! There is a new extension called “Daily Exams”. This extension is modeled off of the “Initial Exam” page, but it can be used to record exams throughout the patient’s recovery. It will save each exam separately and there is no limit to the number of exams you can record. Like all other extensions, whatever is recorded here will be filtered into the “Treatment Log”. A New “Transported by Field” will be in the “Intake” box, which is found in the “Create New Patient” screen. This allows contact information to be recorded about the transporter, if it is different then the Rescuer. On the “Create New Patient” screen, an option has been added at the bottom of the page that can prompt an immediate batch update. For example if you get in 10 ducklings, you can choose to batch update their Age and any other information that may be the same. All of the date fields have a new Date Picker. We took a long time deciding on this new Date Picker, we hope it works well for you. The best thing about this Date Picker is that you can choose an icon with a circle and checkmark that will record “NOW”. However if there is already a date in that field “NOW” will not work. The pagination on the List Records screen is quicker and it doesn’t have to reload each time. Banding and Morphometrics can be exported in a format that can be imported into Bandit 4.0. Auxiliary band information has been added as well. In combine people, it will show you a list of all the matches, not just the first 10. We added in the “Initial Exam” an option for Mucous Membrane Texture as well as Mucous Membrane Color. 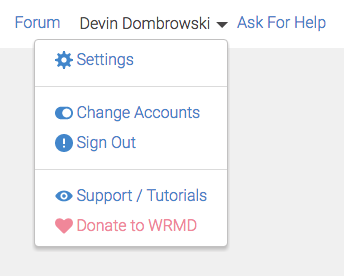 The Header info has been re-designed and simplified: Settings, Change Accounts, Sign Out, Support/ Tutorials and Donate to WRMD is now under the Name of the user, on the top right of the screen as seen below. There are many other small changes that would take too long to list here, so we’ll just sum them up by saying they are all meant to make WRMD simpler and faster for you. Once this update is completed and successful, we have a few new features we plan to create. Some examples: being able to Batch update and Search Lab Values, Batch update prescriptions, Pre-set some prescription values and the ability to filter prescriptions into the Recheck report. There are many more we have lined up. Thank you for your patience and support. We know many of these features are long-awaited and we do try to work through these request as fast as we can. If at any point you notice a bug, or something not working quite right please let us know ASAP. While we run 1000’s of tests, we are far from perfect. This is just a reminder that on December 25th at 4pm PST (12:00am UTC) WRMD will be unavailable while receiving an upgrade. We are planing for a two hour downtime but also hoping to make WRMD available again as soon as possible so hopefully the disruption won’t be that bad. A blog post will follow with the details of the upgrade but to give you a summary of the changes right now; very little will appear to have changed, a few things are being added, we are moving onto new servers and things will get a whole lot faster.